Okay, by now you are well aware that I’m a security geek and safes are my favorite thing in the world. If I could live inside of one, I probably would. Sometimes, I think my fascination with safes is contagious. I know what you are thinking, I am not paranoid, and I don’t scare my friends and family into buying safes. However, most people do have some valuables in their home which they would like to keep away from others. Sometimes burglars, sometimes their kids. I own a wall safe and having another home safe would be too much, even for me. However, my younger brother is not that young anymore, and he has children. He thinks that his work laptop, various documents, and prescription pills are safer away from his children’s sticky hands, and that is okay. That is what I call responsible parenting. Once he decided to purchase a home safe, he knew who to call for help – me, of course! 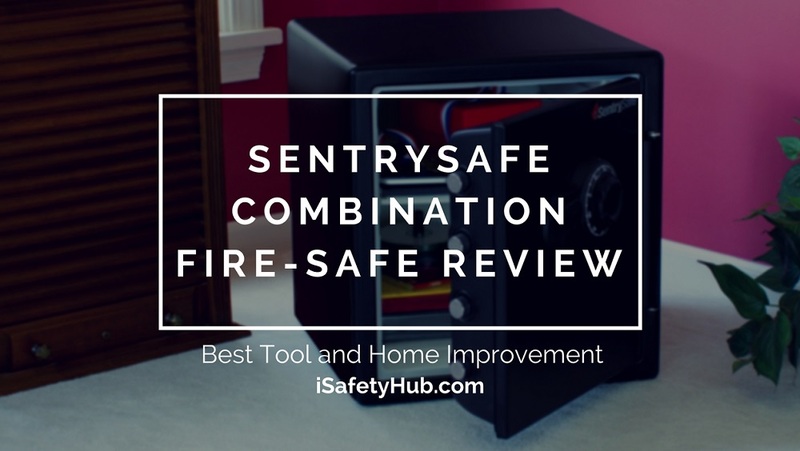 Today, I will lead you through our buying experience and present you the best home safes on the market that we’ve tried. 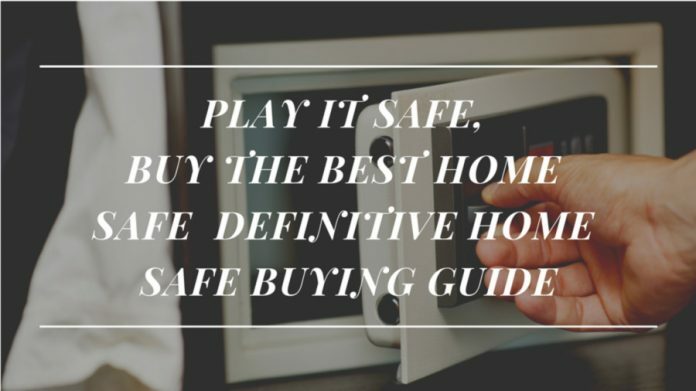 If you are in a hurry, Click here to skip the buying guide and jump straight to the top 5 Home Safes on the Market list. How to Choose the Best Home Safe? What to Determine Before Buying a Home Safe? How much storage space would you like to have? Where would you like to place the safe? What kind of lock are you looking for? When we were kids, our grandpa’s logic was following – if the TV is not heavy and large, it is not worth our money. Today, this rule doesn’t apply to technology, but it still should be your first criteria for choosing a home safe. A safe that is cumbersome is usually built well, and most importantly challenging to move. It should be made of heavy duty steel, and have thick walls or door that can stand up to burglars. If the safe is lightweight, easy to be picked up and carried out of your house, no modern locking technology will safeguard your valuables inside. So, the first lesson, look for large, heavy home safes. Unfortunately, many safes manufactured today are much more lightweight than I would like them to be. Still, if you can bolt them down, they will do a just as good job as heavy ones, because your average burglar won’t be able to move them. 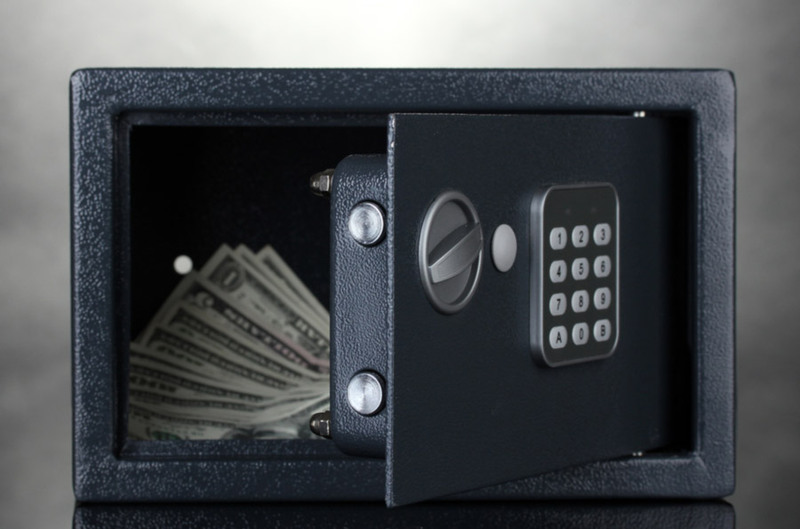 Look for safes that have bolting down as an optional feature. A carpeted interior can be amazing, but it is not necessary. 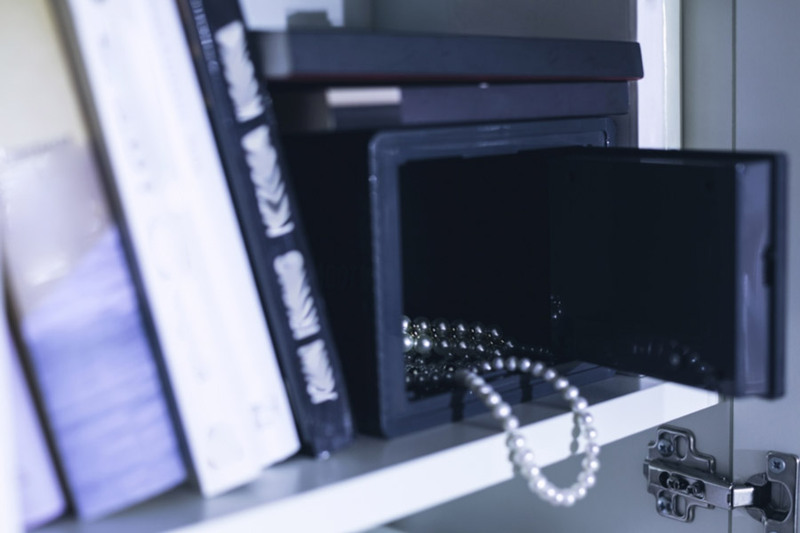 If you want to store some delicate valuables, such as expensive jewelry or anything that can be damaged if it ends up rolling around the steel interior of your safe, having carpeted shelves is an advantage. So, decide what are you going to store in your home safe, and based on that fact, look for a carpeted interior or not. If this is an option, purchase a home safe that is made in the USA. No, this is not just about supporting the local economy, that was a joke. These models are often more expensive but usually made of high-quality materials and significantly sturdier. This is especially important if you are looking for features such as fire and water resistance. In this case, your safe needs to have certifications from ETK (Intertek) or UL (Underwriters Laboratory). These two independent companies are in charge of verifying the manufacturers’ claims of fire, water and theft resistance. Except for the aspects you should pay attention to, there are a few things you should ask yourself, so you could know which type of home safes would be the best for your needs. You can roughly assess how much storage space you need by stacking together everything you want to store in your new home safe. Remember, always look at interior dimensions to find out how much storage space you’ll actually get. For example, a 1.2- or 1.3-cubic-foot home safe will store a 1-foot-high stack of letters. People usually don’t buy too large home safes, but if you decide to do so, make sure it fits through the doorways in your home, and that you can take it up the stairways if you need to. 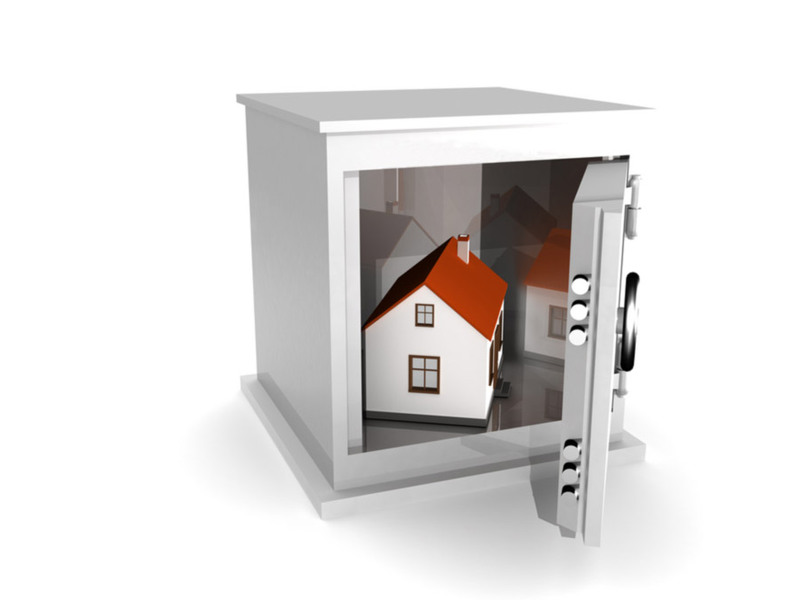 Particularly large and heavy home safes are commonly installed on a ground floor. If you are not sure what is the optimal location for your home safe, you can always consult the manufacturer. As I mentioned in many of my previous buying guides, you can choose between a few different types of locking mechanisms and each one has its advantages and disadvantages. Electric keypads are simple to use, but typically depend on household batteries, and they are not very sturdy. Keyed locks are even more straightforward, but this also means they can be picked, and you must know where is the key at all times. There are also biometric solutions, but they are often significantly more expensive, and if you are not purchasing from a reputable manufacturer, they might be unreliable. You need to weigh the pros and cons of each option, to decide what is the best for you. It offers plenty of spaces. You can program two different codes in it. The reset button on the inside has a cover. Set up instructions are easy to follow. If you bolt it down, it will stay secure. The shelves maximize the storage space. Digital display shows remaining battery power. The keys are well made, with the star-shaped end. It can memorize 32 different fingerprints. It offers plenty of room. The initial set up and code reset are a breeze. It is made of heavy-weight metal. Setting the digital code is easier than expected. I think you will agree with me when I say all of your valuables should be secure in your own home. Stalwart’s electronic home safe will provide you with that luxury. 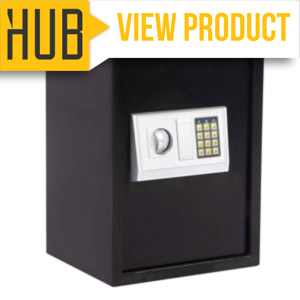 This digital safe can be utilized in your home mounted on a wall or floor. Its interior dimensions are 12.08”x5.5”x7.75”. The LED lit keypad will lock after three incorrect entries, and the alarm will notify you about the attempted theft. I am a fan of small safes, but I always wanted a little more space. With that in mind, I loved how spacious this home safe is. Multiple people can use it as you can program two different codes in it. It is not easy to break into with a cheap coat hanger trick because the reset button is covered. Unfortunately, the metal is only 1.5 mm thick, while the doors are only 3 mm. The batteries tend to jiggle, causing a keypad to stop working. The spring that holds locking mechanism is strong. The mounting instructions make no sense. The metal is only 1.5 mm thick. It might fail to unlock after the first try from time to time. 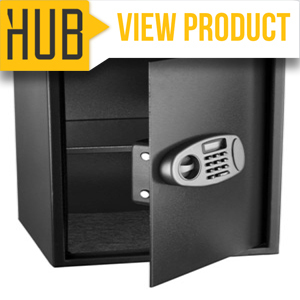 If you want a large, pry-resistant home safe, AdirOffice is here to offer their model with a digital lock. If will provide you with 2.32 cubic feet of storage space and high security. It comes with an electronic lock, two live-door bolts, steel door, and concealed hinges. It operates on two AA batteries, and if you forget the passcode, you can unlock it with override keys. I set up this safe within minutes, on my own! I was surprised at how easy that was. This safe might not be the heaviest one on the market, but if you bolt it down, it will stay secure. The shelves are amazing; they will help you organize the storage space. At last, the batteries are durable. However, if the thief decides to hit the lock with a hammer a few times, he’ll be in just as fast as I installed the safe. The electronic mechanism seems a bit cheaply made, and the shelves are held by two tiny screws. So, if you don’t have to, don’t place anything heavy on them. It is sleek and attractive. The batteries last a very long time. You can open the safe by hitting a lock with a hammer. The electronic mechanism seems cheaply made. Two small screws hold the shelf. You might have some difficulty opening the door. 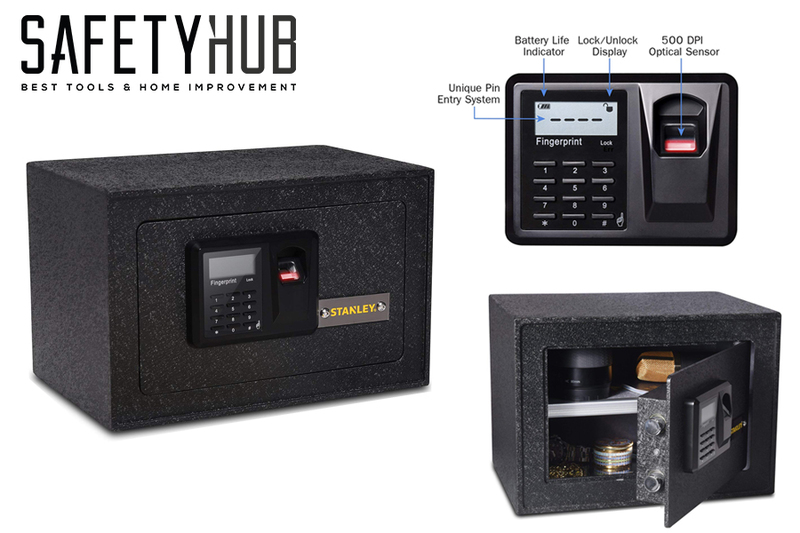 If you want a heavy-duty home safe, Stanley’s model is the one for you. The door is 5 mm thick, with motorized deadbolt locking system and seamlessly welded body, made of solid steel. Its dimensions are 7.8″ x 12.2″ x 7.8″. It comes with a biometric fingerprint reader, electronic lock and an emergency key override option. Additionally, it has an LCD screen that will tell you whether your safe is locked or unlocked and give you information about battery life. My favorite thing about this home safe is how hard it is to pick its lock. The key has a star-shaped end, which makes it super complicated. Also, the mechanism works quietly, and the implemented biometric technology can memorize up to 32 different fingerprints. On the other hand, if you want to access the emergency keyhole, you will have to unscrew the brand’s nameplate first. Also, each time you want to use the fingerprint reader, you will have to press the “#” first. There is no backlight on display, which is inconvenient if there is no light in the room. The pneumonic hinges are quiet. It is solid and well-built. You have to unscrew the nameplate to access the keyhole. You have to press the # button, before using a finger reader. Fingerprint recognition doesn’t work every time. 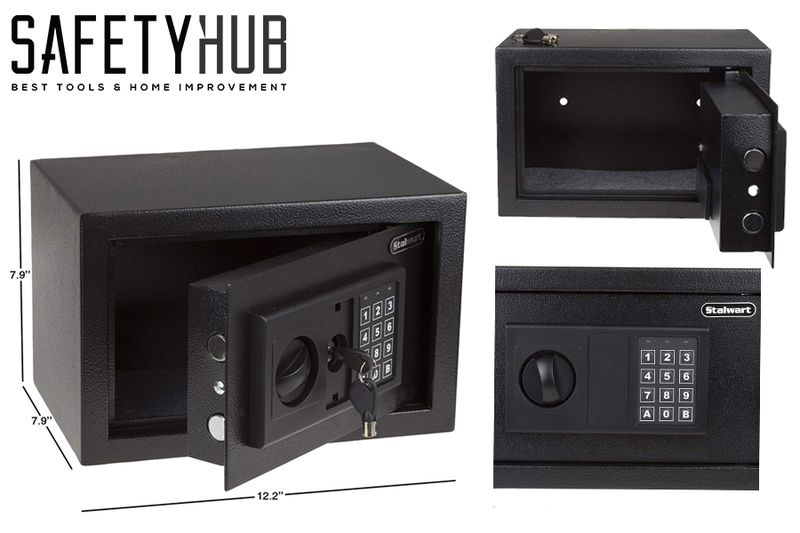 The safe box claims that their home safe is one of the hardest models to break into. Its exterior dimensions are 19.7″13.8”11.8,” and it will provide you with 1.8 cubic feet of storage space. It runs on four AA batteries, it is easily bolted down, and the locking mechanism is simple to program. 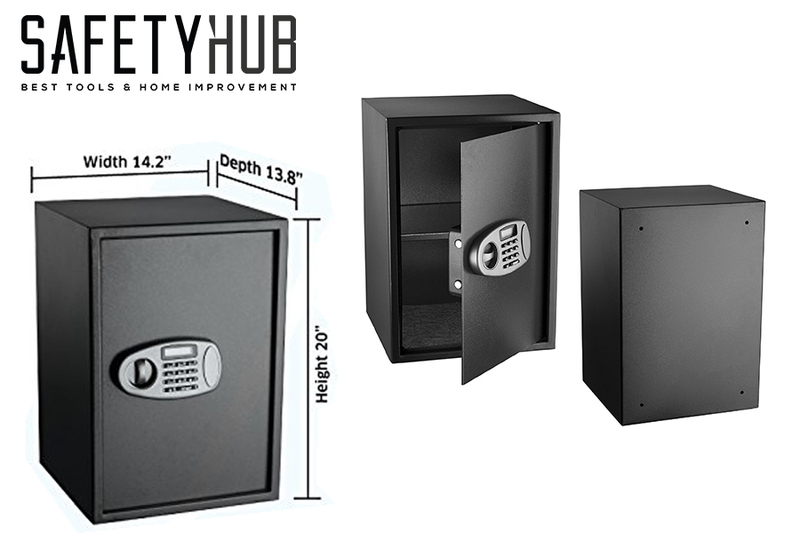 This home safe will notify you when someone is trying to break in, and its shelf will give you a chance to store your valuables more efficiently. The first thing I noticed about this safe was its price. You will rarely find such great value for money ratio. 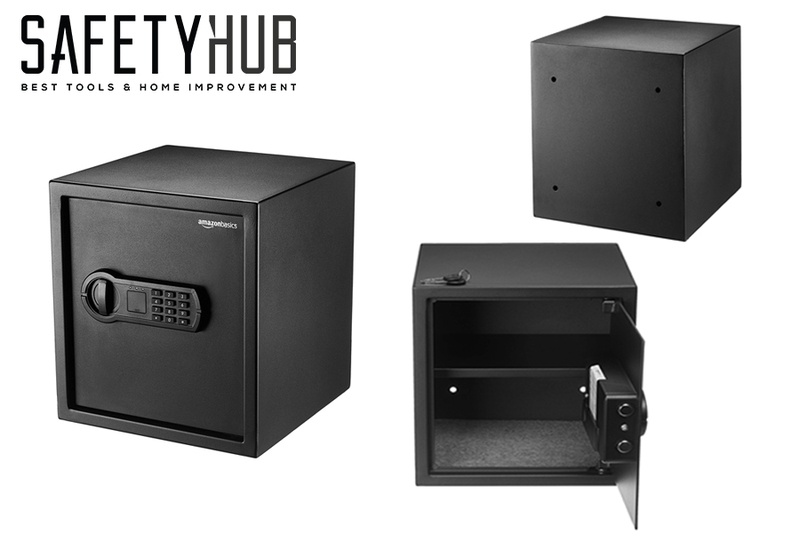 Safe box home safe offers plenty of room; it is easy to figure out and hard to be stolen. If you are a first-time safe owner, I would recommend you something this straight-forward to get you going. However, be cautious, the lock and the door are not strong enough, and I noticed that separate buttons start to fail after some time. The batteries shift all the time which makes the keypad practically unusable. The keypad is easy to use. It is hard to be stolen when bolted down. The lock and the door are not strong enough. Separate buttons might stop working. The batteries in the keypad often shift. The metal is too thin. I love testing different brands out there, but I also fancy relying on a well-known name when I am familiar with its reputation. 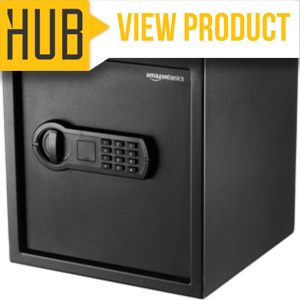 AmazonBasics has a great small safe, so I decided to give this bigger version a try as well. Its interior dimensions are 12.8”x10.6”x14”. 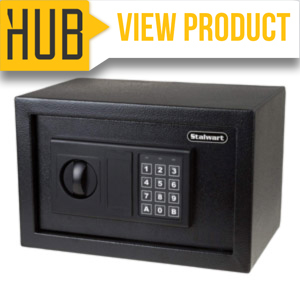 This home safe features a programmable electronic keypad, heavy-duty carbon-steel construction, two live-door bolts, and pry-resistant concealed hinges. Amazon’s home safe is very user-friendly. The digital code is simple to set up, and the unit comes with a 1-year limited warranty. Whenever your batteries are low, the light on the keypad will warn you to replace them. At the same time, you will have a lot of space to store your valuables, and they will be protected by heavy-weight metal. However, no matter how great the construction is, this model is still too lightweight, and it can be quickly moved if you don’t bolt it down. Even then, it can be broken into using a crowbar. The pop-open key-cover usually doesn’t pop open. At last, it doesn’t come with any batteries, which means you will have to spend a few more dollars on it. The light on the keypad will warn you when the batteries are low. It can be easily broken into with a crowbar. The pop-open key-cover door won’t pop open. It doesn’t come with the batteries. After hours of searching and days of testing different products, my brother concluded – all five home safes are reliable and worth the money you would invest in them. However, his personal favorite was Stanley Solid Steel Biometric Personal Home Safe with Fast Access Fingerprint Recognition for Wall, Floor or Closet. He loved the combination of biometric technology and amazing key design. I guess that runs in our family. 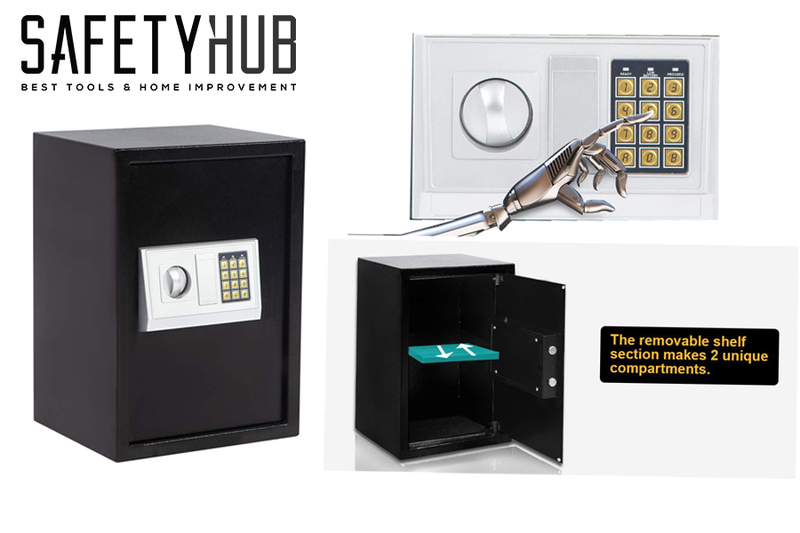 Still, I would like to know – what do you think about these home safes? What are their strong suits and their weakest points? Do you agree with my brother’s choice? Go ahead and leave me a comment! I love discussing different options with my readers! Next articleHeating systems – Is Storage or Panel Best?